Book a 2014 or 2015 tour with Discover Kalamazoo and receive free reserved motorcoach parking in Downtown Kalamazoo! Call us to book your tour at 800.888.0509. Tour must be booked by Dec. 31, 2014 to qualify for the FREE parking promotion. 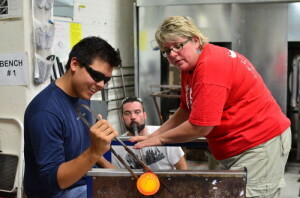 Learn to blow glass at West Michigan Glass Arts Center in downtown Kalamazoo. Once the decision has been made to come to Kalamazoo, the fun really starts: What should the tour include? Art shows and galleries? No problem. Historical neighborhoods and cultural attractions? Got you covered. Specialty-store shopping, unique restaurants? We have plenty. Lakeshore sunsets or wine tasting? Absolutely! Whatever your group would like to do, you’ll find it here. Best of all, high-energy or laid back, whatever you choose always comes with the warm smiles and customer service Kalamazoo is known for. Be sure to check out our Group Tour Planner for group friendly accommodations, restaurants and attractions. You’ll be surprised that a community of our size has so many first-class attractions. Take a look at all there is to see and do here. It’s everything you’d expect to find in communities many times bigger than ours. But, here’s where the small town feel comes in. You can always get to what’s going on without going far. Everything here is incredibly accessible. When you visit Kalamazoo your group will be front row-center for the time of their lives. Click on the “What to see and do” link on the left side of the page to discover what keeps visitors to Kalamazoo County coming back. For more specific “group friendly” activities, please refer to our Group Tour Planner. After an exciting day’s worth of exploration, you want to make sure your group is well cared for and rested for the next day’s adventures. Kalamazoo County is home to a wide array of quality accommodations to suit every taste and budget. Click on the “Where to Stay” link on the left side navigation for a complete list of area lodging facilities. Or, for accommodations with amenities specific to group travel, check out our Group Tour Planner. 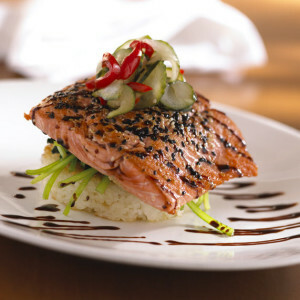 Food Dance is a farm-to-fork, group-friendly and foodie restaurant in downtown Kalamazoo! In Kalamazoo, we really love to entertain people. So it should come as no surprise that restaurant after restaurant here greets groups with open arms. From those with big city flair to those with small town charm, every kind of dining experience your group could want is on our menu. For a complete listing of more than 450 restaurants in Kalamazoo County, click the “Where to Dine” link on the left side of the page. For dining establishments specifically suited to meet the needs of your group, refer to our Group Tour Planner.